Do I need to mention how much I love Luscious Cosmetics??? 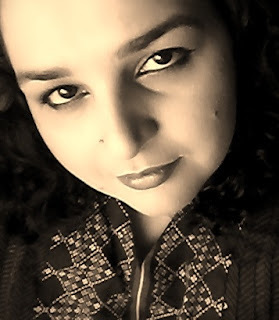 I am sure you all must know that I am a huge fan, (not in size but by heart) of this Pakistani Brand. I am glad that Luscious Cosmetics also never failed to tempt me and make me to crave to have its products. The same happened when I had sleepless nights, tears in my eyes and Color Story Trio in my dreams until I got it. To know More Read more!!! A trio of fashion-forward, coordinating shades of velvety, blendable, eyeshadow for a multitude of looks to suit your mood. Whether you like soft and subtle, or dramatic and bold, Luscious Color Stories eyeshadow trios are a must-have for your makeup wardrobe. A lightweight formula with high color payoff and a smooth, non-creasing finish, each shade can be worn separately or layered together. What is your color story? Available in 12 captivating combinations. I OWN: TREASURE HUNT # 05. The look is the real beauty of this product. It is a round plastic packaging. The round pan has division for three shades, it make the sign of Mercedes :p It has the screw-open lid with transparent plastic front and black plastic rim. Luscious Cosmetics is printed in the transparent lid cover. The box is also very trendy with its white polka dots against black, the common color for Luscious Cosmetics boxes, it also has a transparent sheet attached on the face, in round shape, to show the shade with in the box. Net wt. is 3g and it will survive for 24 months. I am used MUA eyeshadow primer on my eye-lids. The launch of Luscious Color Stories Eyeshadow Trios was a gift of new year, 2013, to the fans and products users.I bought this trio "Treasure Hunt" which caught my eyes due to its very fresh Golden shade. The other two shades are very beautiful too one is shimmery copper-ish bronze and the third one is bronzy dark brown. "Treasure Hunt" is a very well deserved name and catches the attention of Gold-diggers like me. 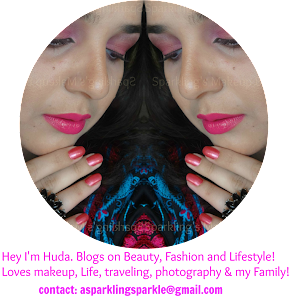 I lacked a fresh golden shade in my stash although had the copperish and bronzy shimmers in the palette I just broke, click here to know what happened. 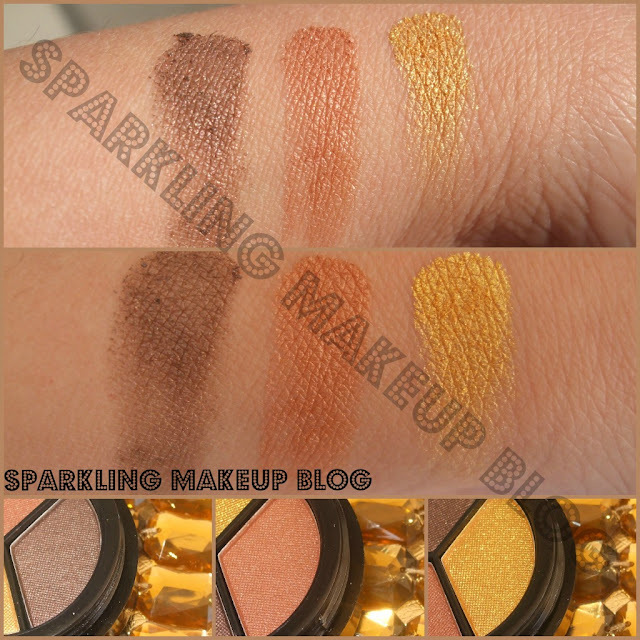 The texture of the shades are very different than Luscious Cosmetics Single eyeshadows, reviewed here and here. Single eyeshadows had a very composed texture (as they are not powdery at all) and very much pigmented, these trios have powdery texture and pigmentation is not that good esp for the goden shade,as during blending I had to apply golden again as again as it was getting lost in the other two darker shades. Being powdery a little fall out will be a problem too. These are shimmery shades with a very soft shimmer in it. 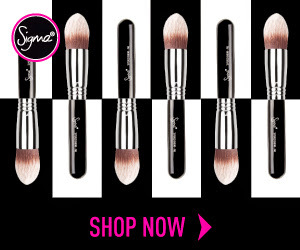 All three shades can be applied individually or Blended together to create a look. The packaging is also very light, not Sturdy as Luscious style, may be there is where they are saving money this time. I am, personally, not comfortable with screw-open lids. These shades will give you good staying time from 4-6 hr, depending on weather condition and your oily lid. I used my MUA eyeshadow primer underneath, as now I also believe that is necessary to give life to any kind of eye makeup. 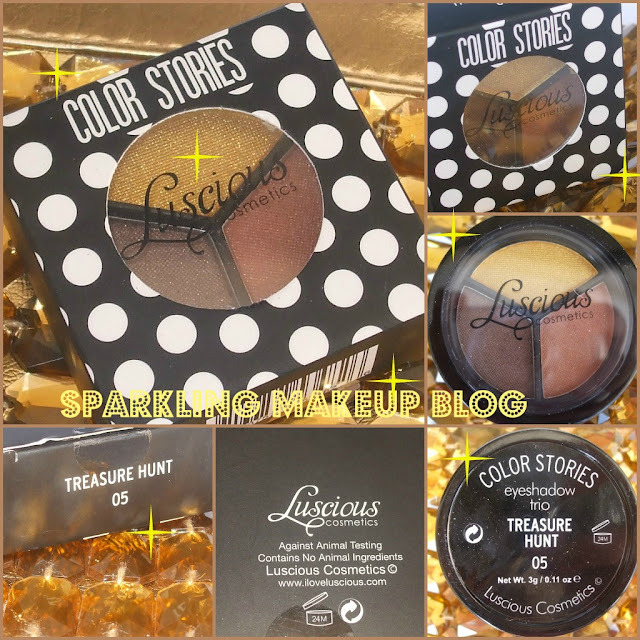 Over all being a die-hard fan of Luscious Cosmetics I am loving the Treasure Hunt trio, the powdery fall-outs and less pigmentation can be managed when you are getting three different shades in one pan and that too on affordable price. 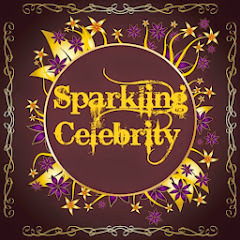 If you are wondering that what is that Sparkling Golden crystals in the background then click here!!! The Color Stories Trios can be bought from the stores having Luscious Cosmetics counters for Pkr 395 each. 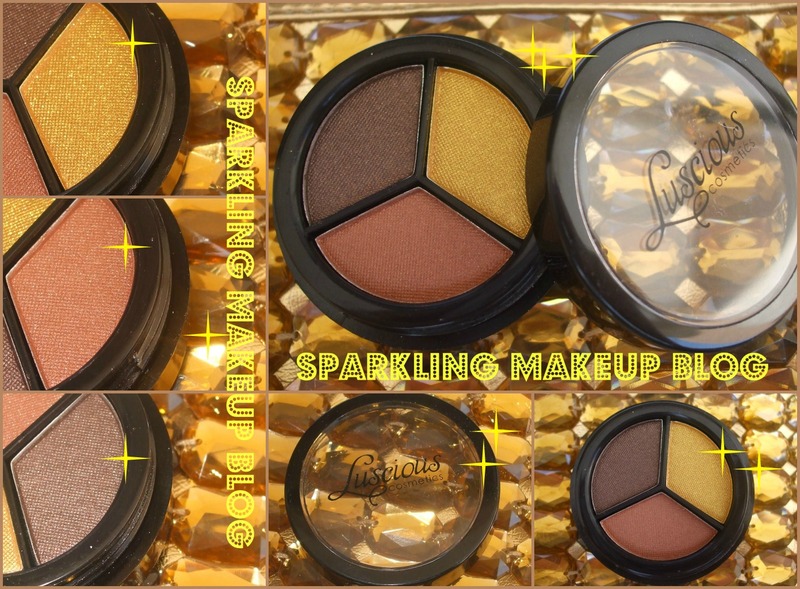 The trios can be bought online from Luscious Cosmetics website. Hope you will like my post. Do comment, like, tweet, share, G+ and PIN IT. If you want to see all the products used in this EOTD do comment. I will surely post it for you. Very nice, love the three colors, will keep my eyes open for this!